So it was national doughnut day a few days ago in the USA. Too bad Holland doesn't joined this fun looking event otherwise I'll be eating doughnuts all day long without feeling guilty. Well ok maybe just a bit. I hope you USA readers spend a good doughnut day! Did you know that the Dutch people invented the doughnut? 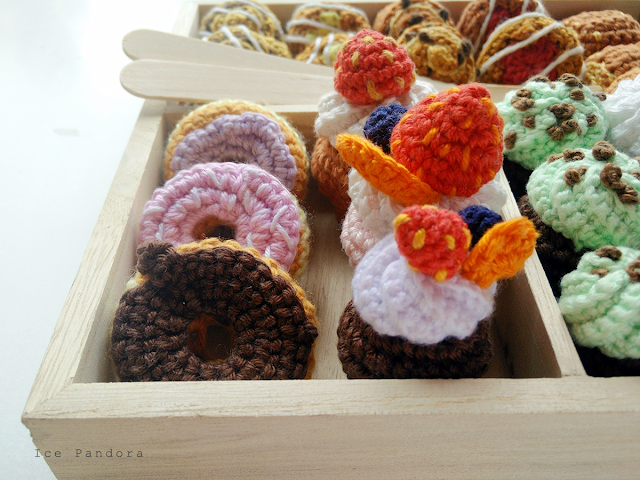 Anyway today's post is not about doughnut but about my little yarn works: cupcakes and pastries. 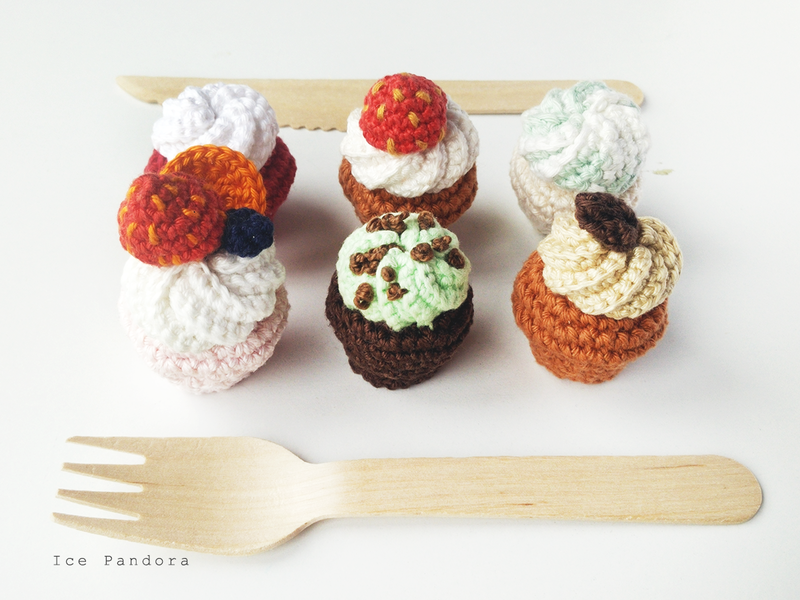 Because I just love making miniature food sizes. That's why I am happy to announce that they are available in my online shop: Storenvy and Bigcartel! And I do worldwide shipping too, woo! I hope this commercial shout out is not too inappropriate because I know people don't appreciate ads. Hence that's why I have adblock on all the time. Blijkbaar was het nationale donut dag in USA. Helaas niet bij ons wat ook een beetje raar is want de donut is namelijk bedacht door Nederlanders. Had ik niet verwacht eigenlijk! Hoe dan ook, die Amerikanen boffen wel met zo'n nationale dag. Vandaag gaan we het niet over de donuts hebben maar over mijn kleine haak werkjes: cupcakes en bladerdeeg hapjes! Want miniatuur dingen maken in, vooral eten is mijn passie. Ik ben daarom ook blij om het volgende bekend te maken: ze zijn te koop in mijn webshop: Storenvy en Bigcartel! Ik verzend ze wereldwijd ook nog eens. Hopelijk is dit reclame spotje van mij niet te ongepast want reclames daar houdt men de meeste niet zo van. Ikzelf heb daarom adblock geactiveerd. How would you like your egg? In a cake of course! I once mentioned before about working on a new project: the maple & pecan Danish. It`s not quite there yet but I`d love to hear your thoughts about the so-far state! Aw such adorable platters. 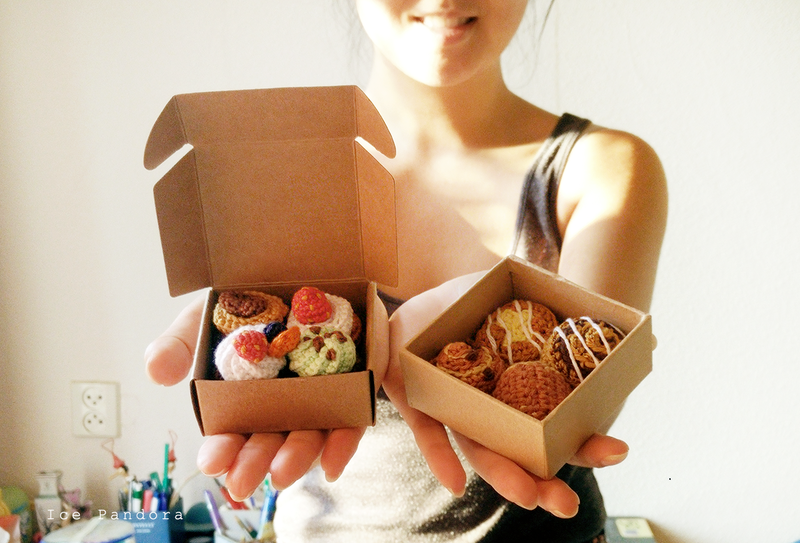 I love how you have them in boxes like the ones you get donuts in too. Hello, I really like your yarnfoods, they are so cute. 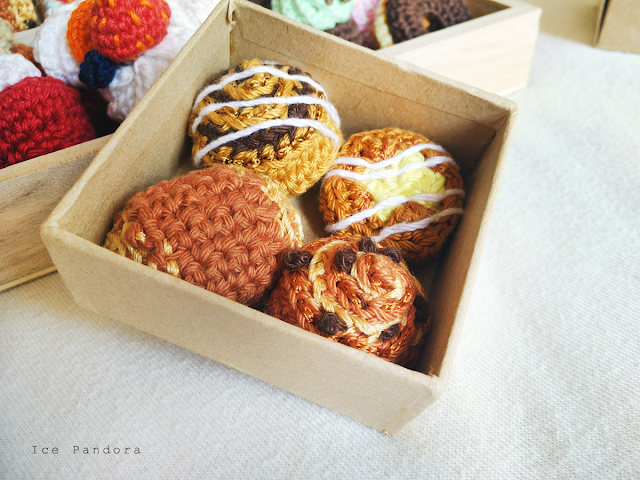 I don't want to bother you or anything, but I'm french and I saw that you named two of your yarnfood "chocolat au pain" and "raisin au pain" but actually it's "pain au chocolat" (or sometime "chocolatine" in the southwest of France) and "pain aux raisins" ("x" and "s" because there are more than one "raisin" in it). 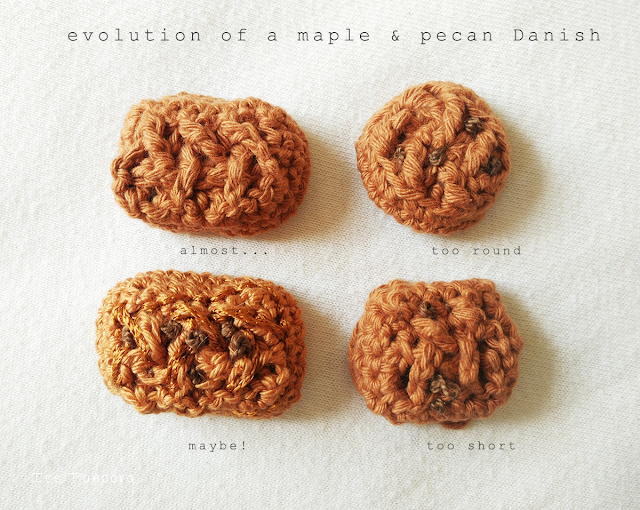 Basically, the way you wrote it, kind of mean that the "flavor" of the chocolate and raisin is "bread/pastry" ^^. But they look really nice and realistic. Personaly the ad don't bother me because it's for something you made and sell. `Hey you! Thank you for kind comment and the name mentioning! Clearly I am no pro at French so thank you for the correction c: !! Oh, so cool, I need to have a look! How cool - congrats on the shop! So cute! 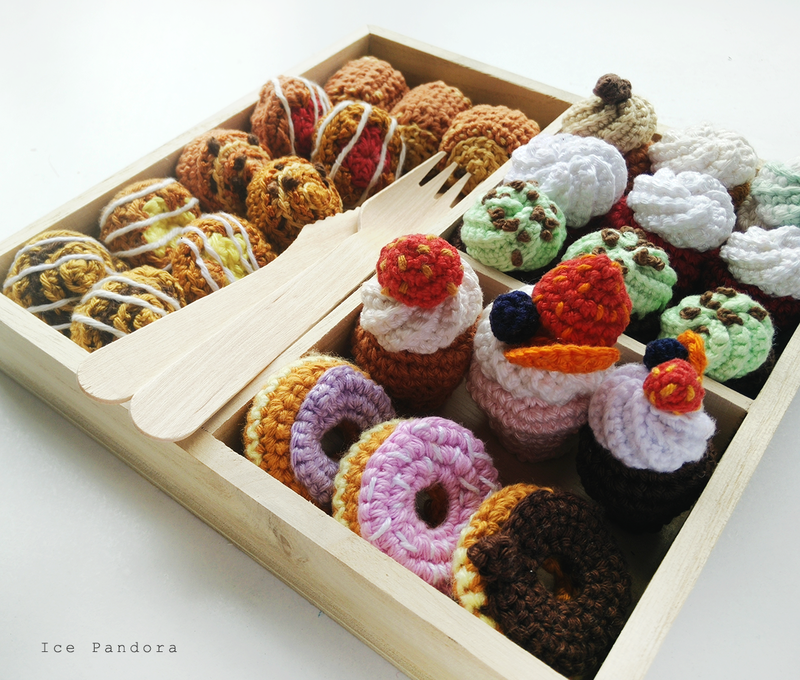 I bet these will sell like hot cakes for kids (or adults) that like to play "house" and have pretend food! Oh, these are all super cute! Great work. AhhhH! As always, love love your stuff! I would totally have a glass case filled with these goodies if they were mine!